Need an apartment or pied-à-terre in Brussels for business or leisure? 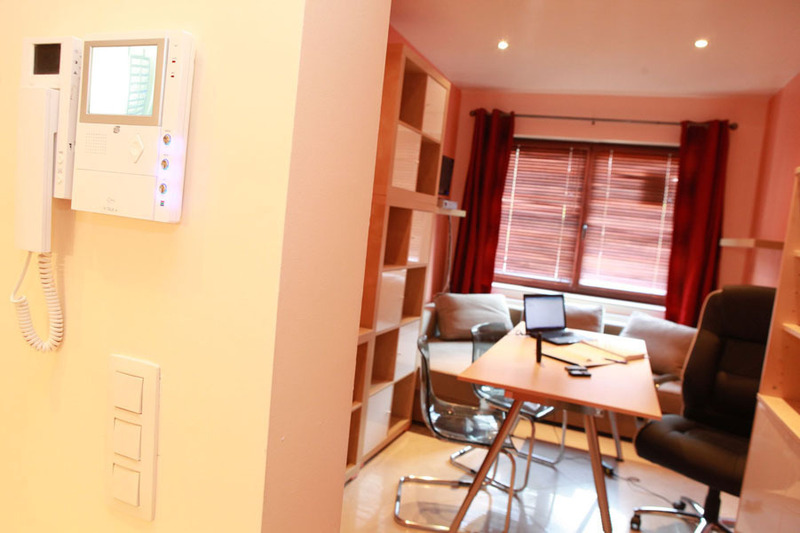 We provide furnished studios and apartments with all mod cons in a quiet and well-located area of Brussels. It’s the ideal solution for short and long stays in the capital of Europe. We also offer service addresses for private or professional use and serviced offices for professionals. Our aparthotels are the ideal solution for a pied-à-terre in Brussels for as long as you need. Ideally located for both business and leisure, La Fraisière Aparthotel is in Anderlecht, Brussels, five minutes from the centre by metro. It’s also close to Erasmus Hospital and Brussels ring road. The area is safe and parking is easy. Each apartment can accommodate one to two guests. La Fraisière Aparthotel is here for you. We provide equipped studio apartments that are recently furnished and decorated in an attractive modern style, bringing you all your home comforts. 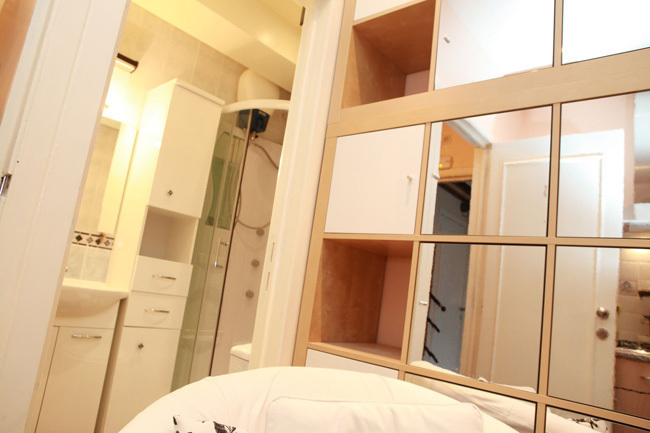 Each studio includes a bedroom with large bed, lounge area, bathroom and fully fitted kitchen. LED satellite TV – DVD, DVD rental. Weekly housekeeping included for short and medium stays (daily housekeeping available for an extra charge). Laundry available in the aparthotel (washing machine and dryer costing €5/each). Located southwest of Brussels, La Fraisière Aparthotel is particularly easy to reach by car or public transport. Rue des Fraises is located between Chaussée de Mons and Quai de Veeweyde, alongside the Brico Plant-It store. Come off the Brussels ring road at exit 16 Anderlecht, the same exit as for the Ikea and Coca-Cola store. Once you have left the ring road, drive towards Brussels for around +/-50 metres, take the first right onto Rue Van Laer opposite the Brico Plan-It store, then the first left onto Rue des Fraises. Number 33 is at the bottom of Rue des Fraises on the left before the bridge. La Fraisière Aparthotel is around 180 m metres from CERIA-COOVI metro station (line 5 Erasmus). La Fraisière Aparthotel is around 140 metres from the Campus CERIA bus stop (service 75). Our studios can be rented from one day to a whole year. Our rental prices are available on request. Hotel taxes and 6% VAT are included in all the stated prices. Room service (housekeeping and bedding) is also included in the prices. They all include full bedding, kitchen utensils, small household appliance, electricity, gas, heating, water, insurance, Proximus TV and Internet (WIFI & cable) with superfast downloads and phone (excluding calls). For rentals by the week, housekeeping and maintenance is provided weekly. For monthly lets, housekeeping and maintenance is also monthly. More frequent services will be charged extra. To rent a studio for one to a few days, don’t hesitate to contact us. +32(0)475/60.75.52. Located in Anderlecht, Brussels, La Fraisière is a modern and comfortable hotel. For regular lets for private or professional use, we provide flexible and attractive terms to help you enjoy a pleasant stay and grow your business in a clean, pleasant and secure environment with complete discretion. Depending on your needs, you can rent a guestroom by the hour, day, week or month. Terms by the hour, see prices by the day, week or month on request. Our prices are valid both day and night and are on a sliding scale depending on length of stay. Business rental contracts require a bond of 50% of the rent and a €100 deposit for the key. Hotel taxes and 6% VAT are included in all the prices given on this page. We accept cash and all payment cards (Bancontact, Visa, MasterCard, etc.). If you have any questions, please phone +32(0)475/60.75.52. To request a booking, you can also use our booking form.